Kenya is located on the equator with the Indian Ocean lying to the east and Lake Victoria to the west. It is home to over 582 square kilometres of incredible natural wonders including mountains, highlands, deserts, savannahs, endless beaches and marine parks. The country can be divided into three main parts: 1) the south eastern coast along the Indian Ocean showcasing hundreds of uninterrupted kilometres of beaches, lagoons, sandbars, small islands and coral reefs; 2) the northern part of the country boasting beautiful highlands and arid desert savannahs; and 3) the rest of the country, featuring a vast highland that is bisected by the Great Rift Valley, along which there are various lakes and volcanic formations of enormous geological interest and incredible beauty. These lakes, the extremely long Turcana, the Baringo, the Bogoira, Nakuru, Naivasha and Magadi, arise along the backbone of the Great Rift Valley and are a paradise for birdwatchers and ornithologists. They are home to numerous flamingos, pelicans, heron, storks, cormorants and many other bird species. In fact, this area is a crucial stop along several important migratory routes including those to Eastern Europe, Russia and the Middle East. Thanks to both the variety and unique beauty of its landscape, Kenya is one of the most visited countries by safari lovers. The country boasts over 50 protected areas between its Natural Parks and Reserves, offering one of a kind encounters with the local wildlife. 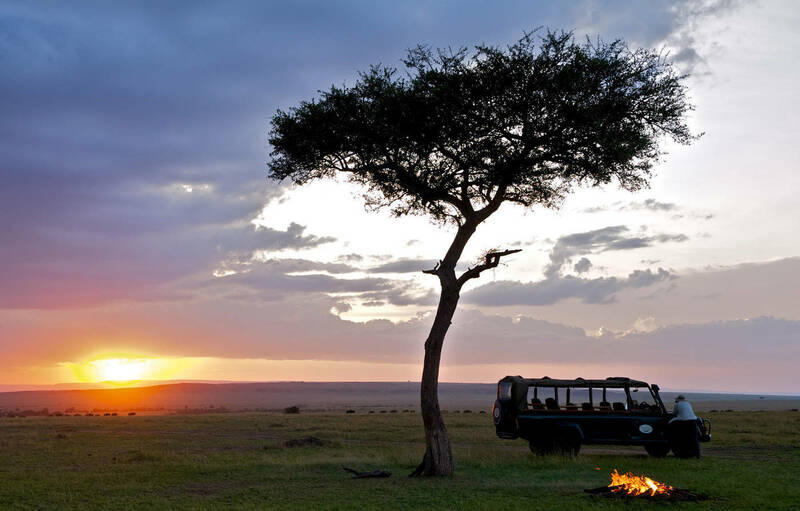 The Masai Mara National Reserve is a large game reserve. It is well known for its rich wildlife fauna, including lions leopards and cheetahs, and is one of the most visited parks in Kenya. The landscape here is a never-ending succession of rolling hills and lush plains that are an ideal habitat for large mammals and, therefore, their prey. There are a large number of lions in this park, and it is often even possible to see them in action during a hunt! 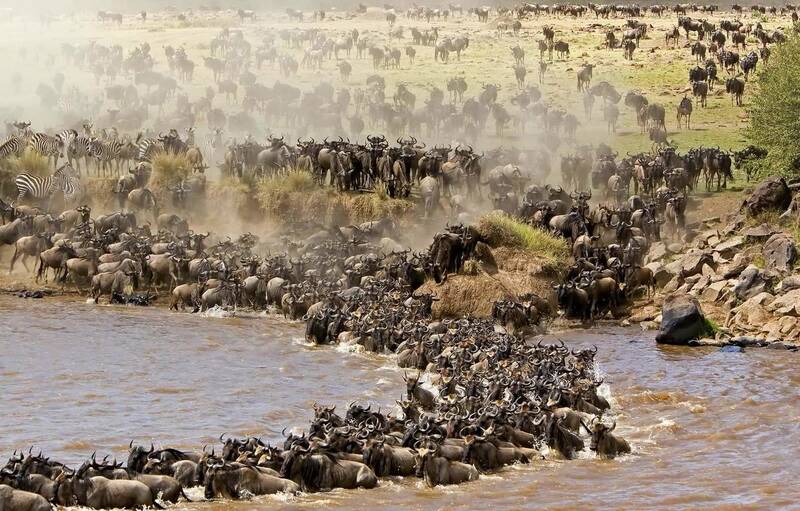 In fact, from August to September/October there is the possibility of experiencing one of the most awe-inspiring events that nature has to offer: the great wildebeest migration. It is truly one of the greatest transhumant experiences on the planet; nowhere in the world is there a movement of animals as immense as the great migration where over two million wildebeest, zebra and gazelle leave the Serengeti (Tanzania) for the greener pastures and flowing waters of the Masai Mara and its River Mara, creating an incredibly magic and indescribable landscape. Here, the visitor can glimpse the true meaning of ‘the circle of life’ in all its completeness, from the birth of young wildebeest, to the death of the older and weaker, a true fight for survival that is both thrilling and moving at the same time. The Meru National Park is one of the lesser explored parks of Kenya, a recommended location for the traveller who wishes to experience the truly wild Kenya outside of a tourist circuit. This park features exquisite landscapes of various types, from open savannahs to the greenest of riparian forests along the Tana and Meru Rivers. In addition to elephants, buffalo, leopards and lions, visitors to this park have the opportunity to also see the ‘special 5’, five extremely rare animals present in only a few parks north of the equator: the gerenuk, Grevy’s zebras, reticulated giraffes, the Somali ostriches and the oryx. Inside the park there is a 44 square kilometre Rhino Sanctuary dedicated to the conservation of white and black rhinoceros. The Meru park became famous after the release of the bestselling book and award winning film ‘Born Free’, which chronicles the lives of George and Joy Adamson and Elsa the Lioness, who is saved and eventually freed in this area. Elsa’s Kopje Camp is the actual camp that George Adamson used to carry out his research during this period of his life. Amboseli National Park is part of the Amboseli National Reserve system, and is most well-known for the imposing Kilimanjaro, the highest mountain in Africa. The park is home to many different types of landscapes. One side of the park is semi-arid while the on the other there is an endless supply of underground water, which originates from Kilimanjaro’s ice cap and filters through thousands of feet of volcanic rock before funnelling into two clear water springs in the heart of the park, giving life to acacia forests, palms groves and swamps. Amboseli is home to many animals, including the African elephant, cape buffalos, impalas, lions, cheetahs spotted hyena, giraffes, and zebras just to mention a few. Just outside the park, there are many Maasai villages, where the Maasai people live incomplete harmony with the environment and wildlife as they have for thousands of years. In fact, with the exception of a few lodges, no human settlements are permitted in the park, which is completely dominated by the incredible African flora and fauna of this area. The Tsavo is the biggest National Park in the country. It is divided by the road from Nairobi to Mombasa into ‘Tsavo East’ and ‘Tsavo West’. Tsavo East is dominated by semi-arid grasses and scrublands, red-earthed flatlands and, near waterways, small ponds, swaps and dense palm groves. The park is known for its Yatta plateau, an extremely suggestive natural phenomenon, which is 290 km long and 10 km wide. It is considered one of the world’s oldest and longest lava flows. Among the main attractions are the Lugard’s falls, a series of white water rapids on the Galana River that have sculpted the colorful surrounding rocks over the centuries, creating a spectacular landscape that is one of the most fascinating features of the park. Approximately 1 km down from Lugard’s falls, there is an area known as Crocodile Point, a natural pool of water that is often frequented by crocodiles, hippos and buffalos. Another attraction of the park is Mudanda Rock, a 20m high and 1.5 km long stratified rock that acts as a water catchment that supplies a natural dam below. It offers an excellent vantage point for the hundreds of elephants and other wildlife that come to drink during the dry season. The Aruba dam and Kanderi Swamps have water all year around attracting many birds throughout the year, but it’s much more than birdwatchers paradise since those same waters attract many mammals of the area as well. Tsavo West is characterised by a variety of landscapes: dense acacia woodlands, vast savannahs dominated by the imposing baobab, volcanic cones, belts of riparian vegetation and rocky ridges. One of the most picturesque attractions in the park is Mzima Springs, a series of four natural springs originating from a natural reservoir under the Chyulu Hills to the north. The springs are the most important hydrological resource in the area for both humans and the natural flora and fauna, producing over 50 million gallons of water per day. Fig and acacia trees line the lakes, which swarm with fish, crocodiles and pods of hippos. Not too far from the springs is the Nguoloa Rhino Sanctuary, a reserve dedication to the safeguarding and repopulation of Black rhinos. In the 1970’s the Black Rhino in this area was estimated to be around 6000 to 8000; by 1989 there were no more than 20, but thanks to work of the sanctuary the population has increased. Lake Jipe is situated in the southwest and is divided in two by the border between Kenya and Tanzania. Other than being an ancient birdwatchers paradise, it is consistently host to populations of hippopotami, elephants and Grevy zebras. This park gets its name from the mountain range that surrounds it. It is the third most important park in the country and stretches from north to south over a wide variety of terrains, covering an area of over 760 square kilometres. At its extremes, you can find the two most important peaks, Ol Doinyo Lesatima (4.001 metres) and Kinangop (3.906 metres). The landscapes of the park is quite varied, ranging from mountainous peaks to deep valleys intersected by streams, rivers, lakes and waterfalls. Higher altitudes are characterized by alpine forests while mountainous forests and bamboo forests are found at lower altitudes. The park is unique in that it offers the chance for visitors to see animals that normally populate the savannah in the setting of a quiet forest. The ‘big 5’ are also present, but it can be more difficult to spot them, given the vegetation. ‘The Salient’, situated near Nyeri is home to a vast series of rain forests and a numerous population of black rhinos. This park is also recommended to bird lovers as there are over 290 recorded species in the park. This highland area is definitely one of the most important sites dedicated to wildlife protection on the continent. It covers over 9.500 square kilometres of terrain and there are large populations of a great number of animals, including elephants, large predators, Grevy zebras, rhinos and African hunting dogs. Inside the area, there are many ranches and private reserves, a fine example of the possible cohesion between human activity and local environmental protection. All the reserves and ranches are regulated by The Laikipia Wildlife Foundation (LWF), a non-profit association that is managed by the actual owners of the various lands. The Lewa Conservancy and Ol Pajeta are only two of the impressive examples of the successful conservation projects that have been carried out in this area; in fact, this last one protects, among other species, a group of chimpanzees, and the project is managed by the Jane Goodall Institute. Every reserve organizes its own tours; in many it is possible to take night or walking safaris with expert guides from the Sambri and Pokot tribes, something that is not possible in the national parks. Mt Kenya is the highest summit in Kenya and the second highest in Africa after the Kilimanjaro. It is a non-active stratovolcano that reaches 5199 metres in height and overlooks the eastern highlands of the Rift Valley. It was designated a national park in 1949 and listed as a UNESCO World Heritage Site in 1997. It covers an area of over 700 square kilometres, and there are several vegetation zones from the base to the summit: lush mountain and bamboo forests, timber forests, chaparrals, fields of heather and a rare Afro-alpine vegetation bordering the glacier line. Typical African mammals can be seen inside the park such as elephants, zebras, hyenas, rhino, buffalo and on occasion even cheetah have been spotted. The cheetah is a bit more difficult to spot, but nonetheless it has been seen even in it melanocytic form (commonly known as the black panther). The best times to visit the park are in January/February or August/September during the drier seasons. Lake Nakuru National Park lies around Lake Nakuru, one of the Rift Valley soda lakes situated at 1700 metres above sea level. Like the other lakes formed after the formation of Rift Valley, it is volcanic, but it is unique in that it is populated by over 1.5 million flamingos and other bird species. 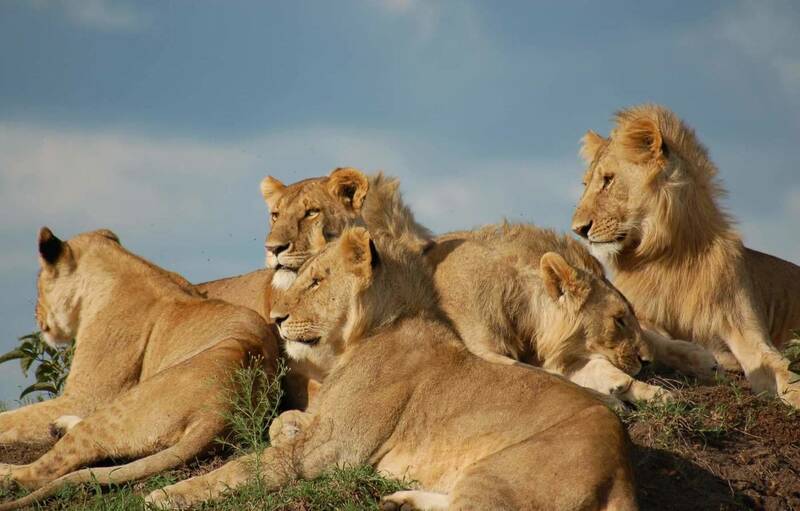 Inside the National Park it is also possible to see lions, buffalo, zebra, hyena, jackals and other species. The government of Kenya requires proof of yellow fever vaccination only if you are arriving from a country with risk of yellow fever.